How to Make the BEST Loaf of Bread on Planet Earth | Have YOU Ben Starr Struck? Tough title to live up to, right? But I was literally stunned out of my mind when I tasted this bread the first time, and each time I’ve baked it since, it seems to get better. This bread makes people scream. Literally. What you are about to read is very, very long. After all, if it were that easy to make the best loaf of bread on planet Earth, you’d already be eating it every day. It’s no walk-in-the-park. In fact, if you don’t currently have an active sourdough starter in your fridge, you’re not gonna get to taste this bread for at least a week, probably longer. 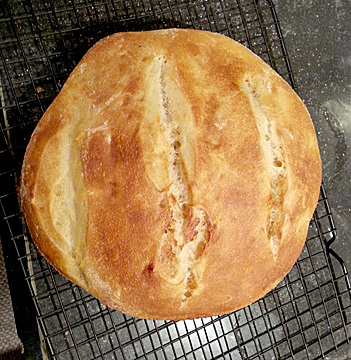 If easy, convenient bread is your goal, try my Easy Overnight Old-World No-Knead recipe, which involves about 5 minutes of effort on the first day, and maybe 10 minutes of effort on the second day. Just a bit of stirring, forming into a loaf, and dropping the loaf into a pan in the oven is all you have to do for that one, and it produces a spectacular loaf. But THIS bread…this bread is just indescribable. The crust is like micro-thin layers of glass that shatter in your mouth when you crunch into it. The crumb is tangy, light, airy, buttery…everything that you think bread SHOULD be, but somehow never is. I warn you: once you taste this bread, you will be ruined for life to all other breads. It is THAT good. To start, you need a sourdough starter. Yes, you can order one online. I don’t recommend it. Make your own. It will make you even more puzzled and awestruck with the miracle of bread, knowing the yeast that leavened your bread came out of nowhere. Even if you order a culture online, you STILL have to coddle it into life over a period of several days, so it won’t save you any work ordering a starter online. (And your starter will EVENTUALLY turn into a local starter anyway, as your local bacteria strains fight off the weird, non-local yeast strains from San Francisco or Russia or Egypt that you paid a pretty penny for in the mail.) A healthy sourdough starter is composed of wild yeasts (primarily saccharomyces cerevisiae) which primarily come from the grain that made up the flour you began with, and a host of lactobacillus bacteria, which live in the air in your kitchen and on your hands. The yeast produce the rising power in the bread. The bacteria produce the flavor and signature “sourness” of sourdough. All these creatures strike a perfect balance in your starter and live as a colony, and once they’re well established, they are VERY resistant to invasion from outside bacteria and molds. This starter recipe is from one of the greatest books on bread ever published, The Bread Baker’s Apprentice, by Peter Reinhart, who is one of the country’s leading experts on bread. It takes 4-5 days to get the first stage started, which is called the Seed Culture. Once you have developed your Seed Culture and turned that into a Barm (a sourdough base), you can keep this in your fridge or freezer indefinitely and use it whenever you like, making the bread-making process only take about 24 hours. You will quickly find, when working with sourdough, that a kitchen scale is invaluable. (You don’t have to measure out sticky starter in a measuring cup, just spoon it into the bowl you’ll be using to make the bread.) You’ll also find that a stand mixer is invaluable, as we’re working with very sticky, wet doughs that are incredibly hard to knead by hand. Combine 1 cup of stone-ground rye flour with 1/2 cup unsweetened pineapple juice at room temperature. Stir until you have a paste or dough and all the flour is moistened. Place it in a large 4-cup glass measuring cup or quart-sized plastic container that you can see through. Cover it loosely with plastic wrap and let it sit on your countertop for 24 hours. Rye flour is minimally processed and naturally contains strains of wild yeast and bacteria that help turn it into bread. When you buy bread flour from the grocery store, it is highly processed, which essentially sterilizes it and removes any wild bacteria and yeast. So we want to start with a flour that contains all the natural bacterias and yeasts that live in harmony with grains like barley and wheat and rye. You can find stone-ground rye flour in almost any grocery store these days. But pineapple juice? The problem with starting with “live” flour like stone ground rye is that it ALSO contains a type of bacteria called leuconostoc, which doesn’t have a lot of natural leavening power, but LOVES to feast on moist flour. Left to its own devices, the leuconostoc bacteria will dominate the culture in your early days of starting the Seed Culture, and will create TONS of carbon dioxide as it eats the sugars in the flour, and will make you think your starter is very healthy. It is…with the WRONG kind of bacteria! Luckily, pineapple juice kills leuconostoc bacteria, but doesn’t harm the GOOD yeasts and lactobacillus bacteria we want to cultivate for our culture. So use the pineapple juice! It will ensure a strong Seed Culture. You shouldn’t notice much difference in your rye/pineapple dough. Add 1/2 cup unbleached bread flour and another 1/4 cup unsweetened pineapple juice, at room temperature, and stir or knead until everything is well mixed. Press the dough flat into the measuring cup, cover lightly with plastic wrap, and let it ferment another 24 hours on your countertop. On this day you should see that the culture has risen a bit and gotten kind of bubbly. Spoon out about half of the culture and discard it. (I know…it hurts. But you’ll be doing a LOT of discarding of sourdough culture if you keep it up, and right now it’s not healthy enough to share with friends, so just toss it or feed it to your chickens.) Add an additional 1 cup (4.5 oz) unbleached bread flour and 1/2 cup filtered water, at room temperature. Why filtered? The chlorine and other compounds added to public water supplies to ensure they are free from bacteria will also sterilize your culture! So use bottled or filtered water that has no chlorine in it. Mix until you have a cohesive dough, then press it flat into the bottom of the measuring cup. Now make a little mark with a marker on the side of the cup or container so you know the original level of the dough. Let it sit on your countertop again for 24 hours. Take a look at your Seed Culture. If it has doubled in height or more from the line you marked, you’re ready to feed it again. If it hasn’t doubled in height, leave it on the countertop for another 12-24 until it HAS doubled in height. Once you’ve got a doubled height, discard half the Seed Culture and add 1 cup (4.5 oz) unbleached bread flour and 1/2 cup filtered water, at room temperature. Stir until everything is combined, then press it into the bottom of your measuring cup once again, and make a new mark at the top of the dough. Now let it sit until it is doubled. This can take anywhere from a few hours to a day or two. Once it’s doubled, you’re ready for the Barm stage. Measure out 1 cup (7 ounces) of the Seed Culture and discard the rest. To this, add 3 1/2 cups (16 ounces) unbleached bread flour and 2 cups (16 oz) filtered water, at room temperature. Stir everything together until it is well mixed. You’ll have a sticky paste. Transfer it to a container that’s at least twice the size of the dough, and cover the container loosely with its lid or plastic wrap. Let it sit on the countertop for 6 hours until it’s bubbly. Then put it in the fridge overnight. The next day, you can use the Barm to make bread. From this point forward, you need to feed your Barm the day before you plan on cooking with it. But you don’t have to feed it every day. You don’t even have to feed it every week. IDEALLY, the Barm should be fed every 3-4 days, but you can leave it for up to a month in your fridge if you want, and you can bring it back to life with a feeding or two before using it. If you aren’t going to use your Barm for over a month, put it in the freezer, and it will last for a year or longer. To feed your Barm, remove it from the fridge or freezer. Let it come to room temperature. (This will obviously take longer if it was in the freezer.) Discard half of the Barm, or give it to a friend, and then weigh or eyeball the barm. You want to double it in size each time you feed it. (Don’t forget to factor in the weight of your bowl or container! I keep my Barm in a large tupperware that I’ve written the weight on, so I know to subtract that much from the total weight so I know how much the Barm inside it weighs.) If your Barm weighs 1 pound after you’ve discarded half of it, you need to expand it to 2 pounds. You always feed with equal weights of bread flour and filtered water. So if you need to feed 1 pound of Barm to make it 2 pounds, you’ll add 8 ounces of bread flour and 8 ounces of water. This is where a scale comes in handy. It’s okay to continue discarding the Barm until you have an easy number to work with, like 1 pound. You don’t normally need a TON of Barm to make bread. The loaf this recipe makes only call for 2/3 cup or 4 ounces of Barm, so don’t worry about keeping a ton of Barm around. 1 or 2 cups of Barm is entirely sufficient. You can easily build it up very quickly across a few days if you need to. Each time you feed your Barm, leave it on the countertop at room temperature, covered lightly, for 6 hours. Then put it in the fridge overnight before beginning the bread process the next day. Just remember that if your Barm has been in the fridge for a month, or the freezer for a year, it’s not healthy enough to leaven bread the next day, so you’ll need to feed it EVERY DAY for 2 or 3 days until it’s vigorous enough to make bread. Sounds complex, but it’s not. Feed HEALTHY Barm the day before you make bread. If your Barm isn’t healthy (ie, hasn’t been fed in more than a week), feed it 2 or 3 days in a row until it gets really bubbly after 6 hours on the countertop, then put it in the fridge overnight and make bread the next day. Stir this together. It’s gonna be a bit stiff, so you may have to work it with your fingers if you’re not very strong with the spoon. Then cover the container with plastic wrap, let it sit on the countertop for 4-6 hours until it has doubled in size, then put it in the fridge overnight. 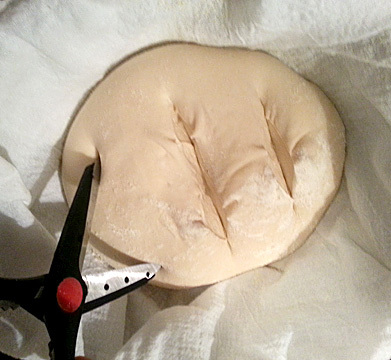 Knead the dough for about 5 minutes until it is smooth and silky, then cover it tightly with plastic wrap. Place in the fridge overnight. When you add yeast and water to flour at the same time, the yeast start going crazy and multiplying…however, they are having to feed on a small amount of sugars that naturally exist in the flour, and they can’t unlock the complex starches that exist. With commercial breads, and homemade breads made with commercial yeasts, you add A LOT of yeast to help counteract the lack of simple sugars, so the bread leavens anyway…unnaturally. But we rarely give the dough time for the natural enzymes in the flour to do their job of breaking down the starches, so that the yeast have something MORE to eat. By hydrating the flour for 12 hours BEFORE adding the yeast, I’ve discovered that you end up with a bread that is much more complex and flavorful and light, because the yeast have LOTS of simple sugars to eat when they finally meet the dough. This step is my own innovation. These 2 steps can be done up to 48 hours before the day you plan on baking the bread, but an overnight refrigeration is entirely acceptable. 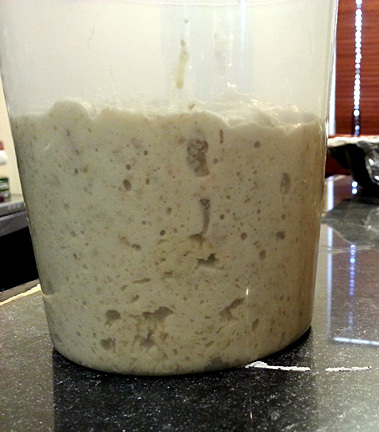 After the starter and dough have been in the fridge for at least 8 hours (ie overnight) or up to 48 hours, remove both from the fridge and let them sit at room temperature for 2-3 hours. Scrape the starter out of its container onto a generously floured surface and cut it into 8-10 pieces. Reattach the stand mixer bowl containing the dough, and begin kneading with the dough hook. Add a piece of sourdough starter every 15 seconds or so. Once all the starter is incorporated, knead the bread for 5 minutes. It should just stick to the very bottom of the bowl. If it’s more sticky than that, you’ll need to add bread flour, a few sprinkles at a time, until most of the dough clears the sides of the bowl, and only the very bottom sticks to it. If the bottom isn’t sticking at all after a few minutes of mixing, add a few drops of water until the very bottom DOES begin sticking to the bowl. This bread dough doesn’t look anything like the dough you’re accustomed to making. It looks MUCH more wet and much less smooth. Don’t worry. This is because you’re accustomed to kneading dough with flour that hasn’t been fully hydrated yet, so you get that “dry, smooth” sensation when it’s being kneaded. This dough is different. After 5 minutes of kneading, turn off the machine and let the dough rest for 10 minutes. Then turn the machine back on and knead an additional 5 minutes. Then scrape the dough into an oiled bowl using wet fingers, cover tightly with plastic wrap, and let it ferment in a warm place (preferably 76-80 degrees F, like the top of your fridge, or the inside of your cold oven) for 4-8 hours, until it is doubled in size. There’s no harm in letting it go LONGER than 4 hours, but don’t shape it until it has at least doubled. I typically let it sit for 6-7 hours. Sometimes I let it sit for 6 hours on the countertop and put it BACK in the fridge overnight, baking on the 3rd day, which results in even more flavor. DO NOT try to rush this bread to rise by putting it in the oven with the light on, putting it over simmering water or a warm stovetop, or placing it in a cold gas oven (the pilot light keeps the chamber too warm). At temps above 80F, the wild yeasts begin creating off flavors that will damage your bread. The most delicious loaf of bread on planet Earth cannot be rushed! Time makes good bread, not impatience. Now it’s time to shape. Get a bowl about the same size as the Dutch oven you’ll use to bake the bread. Line it with a soft dish towel and sprinkle it liberally with cornmeal or flour. Lightly dust the countertop with flour. Gently scrape the dough out of the bowl with wet fingers, to prevent sticking. Then gently form it into a round loaf. 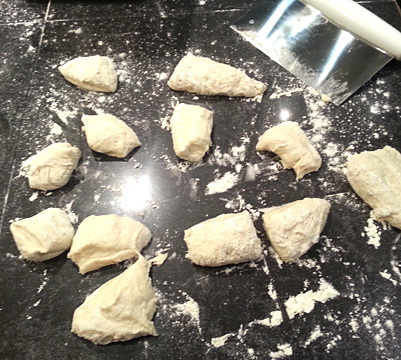 This is easier if your hand are coated in flour, and the dough sticks to the countertop. There’s no way to describe exactly how to do this, but you’ll get the hang of it quickly. 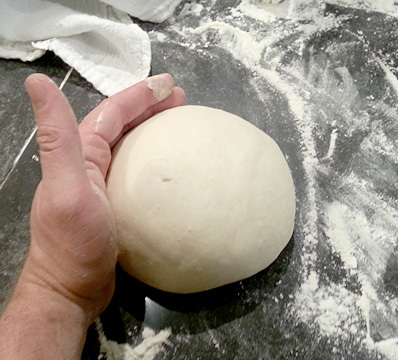 You want to form a tight ball of dough by moving your hands around it gently but firmly, tightening the ball of dough. Once you’ve formed the tight ball, rub it all over gently with flour, and set it into the prepared bowl lined with towels and cornmeal. Cover it with the corners of the towel, or a new towel if the one in the bowl isn’t large enough. Let the loaf sit on the countertop to rise until double, which can take anywhere from 2-4 hours depending on conditions in your kitchen. About 45 minutes before baking, place a cast iron Dutch oven in the oven and preheat the oven to 425F. Baking bread inside a Dutch ovens holds in the moisture that makes bread develop a truly epic crust. Professional ovens have steam injection that keep the inside of the oven very moist during the first half of the baking process. This moisture keeps the crust from developing too early and allows the inner texture of the bread to be light and airy. It also gelatinizes the starches in the crust that will later solidify into a glassy, crunchy crust. If you don’t have a cast iron Dutch oven, you can’t make the best bread in the world. Sorry. I have many cast iron Dutch ovens because they are the SINGLE best pot in the kitchen, so check places like Big Lots and Walmart and Ross and Marshalls for clearance prices on cast iron. It can be raw cast iron, or enameled…it doesn’t matter. Enameled requires less maintenance, but the stress on the enameled layer that comes from preheating the Dutches at high temperatures means your enamel will eventually fail and chip off. You can still use failed enameled cast iron for baking bread if you are careful, but DO NOT cook or braise with it, or you may end up with chips of enamel in your stew! When the loaf has doubled in size, it’s time to bake! First, score the top of the loaf. You can score with a knife, or the easier way, with scissors!! You want to make 3 VERY DEEP cuts almost halfway down through the loaf. This allows the loaf to open up as it rises in the hot oven. The deeper your cuts, the more the loaf will expand. Open the oven, gently move the rack out and pull the lid off the hot Dutch oven. Place your dominant hand gently onto the surface of the dough with your fingers outstretched (like you’re making the sign for the number “5”), holding the bowl with your other hand. Gently flip the bowl over, letting the dough drop into your hand. Then gently turn the dough rightside-up as you drop it carefully into the hot Dutch oven. Don’t worry too much about deflating the dough. Treat it gently, but it WILL spring back and rise beautifully when it gets inside that hot Dutch oven! Immediately turn the bread out onto a cooling rack. Give it a few pokes through the crust with a knife to release steam so that the crust doesn’t end up steaming and getting soft. This bread is simply indescribable when eaten fresh from the oven while still hot. It’s not easy to slice hot bread, but if you have a good bread knife, and a dish towel to protect your hand from the heat, slice this bread, slather on good butter or olive oil, and you’ll think you’ve died and gone to heaven. And no bread, no matter what bakery it’s from, will ever, ever, ever, ever, ever match up. The crust shatters in your mouth like thin glass. The flavor is slightly tart, slightly sweet, yeasty, moist, and delicious. Impossibly buttery, though, mysteriously, there’s no added fat. There’s simply nothing like it. This entry was posted in Blog, Recipes, Yeast Breads and tagged Alton Brown, best, bread, Bread Baker's Apprentice, homemade, how to make sourdough starter, over night, overnight, Peter Reinhart, recipe, sourdough, sourdough starter, ultimate. Bookmark the permalink. The most amazing loaf I have ever made! I used a well established whole wheat sourdough starter. Then used 1cup sifted, freshly ground whole wheat flour to mix with the starter and 2 cups sifted, freshly ground whole wheat flour plus 2.5 cups all purpose flour for the second step of bread making. I did add 2 tbsp vital wheat gluten as well. It was a marvelous dough to work with and utterly deliciou! I am going to try bumping up the amount of whole wheat flour and see how far it can go. Thanks for the great recipe! Thanks for the great input, Shellie! Lots of folks are keenly interested in whole wheat, and I’ll be addressing the use of whole wheat in sourdough in my new web series. Keep us posted on how far you’re able to go and still maintain an open texture!